Found all over South Africa, with the exception of the Western Cape's Peninsula and a small part of the Garden Route, which is the coastal area where the Western and Eastern Cape meets. This best-known of all the foxes of South Africa is maybe the most hunted of all species in the country. And yet, its numbers haven't reflect negatively on this cat and mouse play which farmers and hunters have tried on this ingeniously witty little creature. Being a disturbing problem to sheep and small cattle farmers all over the country, declared a pest and being at the receiving end of may an animal control officer's endeavor, it has escaped the bulk of all the traps, hunting dogs, poison and shots that was meant to be the black-backed jackal's end. It is a well known character in many a South African tale where the trumps up jackal will very seldom be found at the soaring end after the punchline was given. The daytime's isn't used for his mischievous activities, except in very undisturbed fields. It feeds on small mammals‚ and yes, they do eat lamb! They also enjoys dead and putrefying flesh (sometimes the left-overs after the lion and hyena have both had their share). In the vulture/jackal combat, he regularly steals from a vulture. It is even recorded that in a very competitive dual with a vulture, the jackal opted to have the vulture itself! 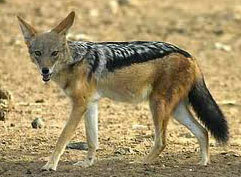 The hungry jackal won't ignore birds, reptiles, insects, or fruit. The jackal family sticks together and both the father and last years pups may assist the mother with this years puppy-raising drills.